As recently as May, UAW Secretary-Treasurer Gary Casteel reiterated that the union had no intention of holding another union election at the Tennessee plant. The UAW said it filed for an election by 165 skilled trades workers at the Volkswagen AG auto plant in Chattanooga, Tenn. The union lost an election to represent all production workers at the plant in February 2014. "A key objective for our local union always has been, and still is, moving toward collective bargaining for the purpose of reaching a multi-year contract between Volkswagen and employees in Chattanooga," Mike Cantrell, president of UAW Local 42 at the plant, said in a statement today. "We support our colleagues in the skilled trades as they move toward formal recognition of their unit." The filing for the election was made today with the National Labor Relations Board. Federal law allows for a portion of a work location to be represented by a union, the UAW said. As recently as May, UAW Secretary-Treasurer Gary Casteel reiterated that the union had no intention of holding another union election given the ability of VW Chattanooga to recognize the union without going to those lengths. He said the union was looking to become a collective bargaining agent for workers through voluntary recognition from management. 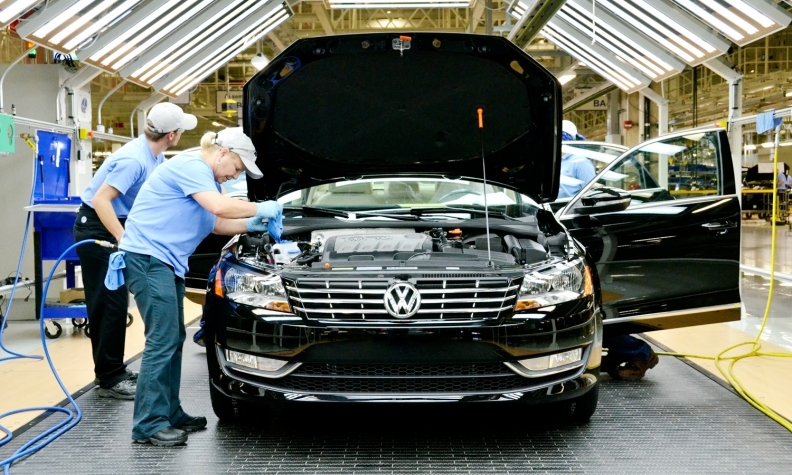 The UAW has been pushing a German-style works council at VW’s plant in Chattanooga while continuing its push for collective bargaining for members there following the company’s recognition that the union represents at least 45 percent of plant workers. That recognition has given UAW representatives at the plant regular access to plant management to talk about issues of mutual concern. As part of a new works council submission to VW, the UAW proposed that the union first be designated as the collective-bargaining agent for workers at VW Chattanooga. Then, worker roles on the works council could be negotiated through that collective bargaining. David Barkholz and Reuters contributed to this report.